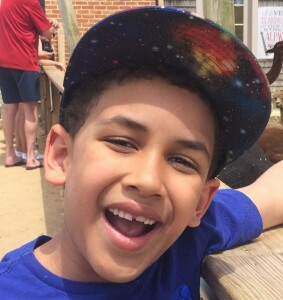 My son, Simon, has taken a risk and let go of my hands for the first time today, up-rocking breakdance-style with intricately syncopated steps, twisting his waist emphatically, using all parts of his fast-moving feet, and following their gestures with sharp-angled arms. He is nearly as tall as me, lithe and bursting. Tight, brown, carefully-clipped curls frame his face, and his dark eyes flash with excitement and focus. Simon and I are at the Joffrey Studio in the West Village – in a Sunday morning 5Rhythms class. Simon suddenly looks around at the many dancers, then grabs hold of my hands again, pulling hard on my wrists. Of everything that I do as a parent, I think giving Simon access to the 5Rhythms is, quite possibly, my best offering. Even at the age of 7, the practice has already equipped him with a powerful toolkit for moving through life. Three years before Simon was born, I started dancing the 5Rhythms at the suggestion of a trusted friend. For the first two years of dancing, I cried almost constantly. I found that I needed to collapse again and again — an antidote for years of holding things back in difficult relationships. Sometimes I was crying out unexpressed grief, sometimes I was crying for joy; and often I wasn’t sure why I was crying — only that my at once tender and defended heart was becoming more and more available. On first glance, a 5Rhythms class would probably just look like a wild dance club, but for most people, it is also much more. For me, it is a laboratory for life, encompassing psychological, emotional, philosophical, interpersonal and shamanic levels. I had already been practicing for two years when I became pregnant with Simon. For me, pregnancy was a study in contrasts. My relationship with Simon’s father was marked by conflict and I felt anguish on a daily basis. At the same time, I loved being pregnant. In dance, I found a way to express and release the pain I was experiencing. Although I was as big as I would be by six months into pregnancy, I never moved like a pregnant woman as dancing gave me the ability to work with the fast changes in my body and allowed me to adapt consciously as my balance shifted. Also in dance, I was deeply aware of the miracle of pregnancy. I felt so full. So un-lonely. So fascinated with my own body. I danced both our rhythms at once, marveling that I contained two heartbeats and that I was both one person and two people at the same time. 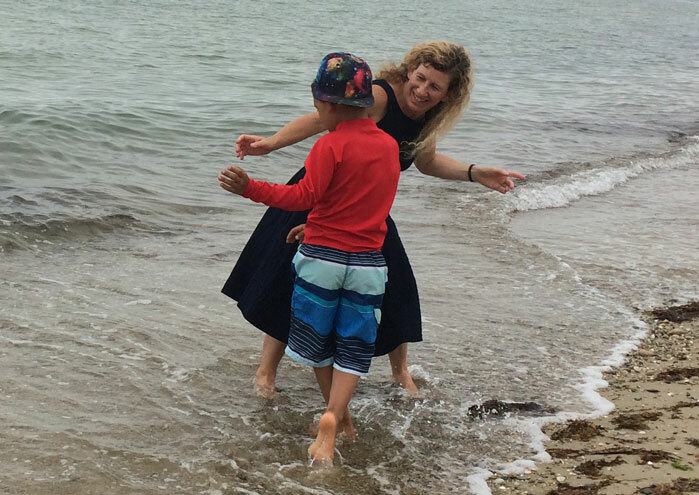 When I was five months pregnant, I danced like a wild animal in the rhythm of Chaos during an intensive workshop and became concerned that I might have harmed my small son. After that, I decided to play it safe and take a break from 5Rhythms until after the baby came. Things got even worse in my relationship, however, and after a week I realized that I urgently needed my supportive 5Rhythms community to balance out the conflict at home. I also feared the pain I was experiencing could harm my son unless I was diligent about moving and not allowing the energies of afflictive emotions to lodge in either of our bodies. In a way, I am grateful even for the difficulty, as it caused me to stay with practice, yielding moments of incomparable beauty. I continued to attend 5Rhythms classes until less than a week before Simon was born. At a 5Rhythms class, sometimes an arrangement of objects and images is included in the studio, rather like an altar or an artwork installation. Right after Simon was born, the same friend who had first invited me to 5Rhythms included a picture of him in such an arrangement for the Friday Night Waves class. In the picture, he is tiny, his head nestled in the palm of Daddy’s hand, in exquisite profile. The teacher, Tammy Burstein, also announced that Simon had arrived, and, as my friend tells it, several dancers were moved to tears by this news, since they felt they had been dancing with him all along. I took a break from classes right after Simon was born, but continued to practice daily in my apartment, putting him down in a baby chair when my movement became vigorous, but holding him through much of the practice. After a month, when he could take a bottle and I could be away from him for a few hours, I resumed regular attendance, at least on Friday nights. When Simon was an infant, still only held or carried, I brought him several times to a small daytime 5Rhythms class that Tammy Burstein held at the now-defunct Sandra Cameron dance studio on the Lower East Side. I would dance with Simon in my arms, letting the weight of his little body pull me into dipping spins in Flowing, his presence affecting my experience of each of the rhythms. Dancers would partner with us, and we had many playful, deep, fascinating exchanges. I felt confident about dancing while holding him, and continued to be fully engaged in my own practice. Sometimes Simon would travel with other bodies, usually comfortable with being passed around. Once, I sent Tammy a song I thought she would love, “Be My Little Honeybee” from one of Simon’s children’s albums. After two absorbing waves, she surprised me by playing the honeybee song in the rhythm of Lyrical. Simon, though still barely speaking, recognized it and lit up with delight. The moment lives in my memory as one when I was fully aware of the gigantic, tender love that I feel for my son. In fact, it has been inside 5Rhythms classes, when I am not thinking about red tape or setting boundaries or the challenges of day-to-day living, that I have most fully noticed and enjoyed the powerful love that I have for him. I knew from the beginning that I wanted to raise Simon with the 5Rhythms. Truthfully, I couldn’t imagine not raising Simon with 5Rhythms. But the question was: How? A few 5Rhythms teachers offer classes for children, but there are no classes for children in NYC, where we live. I was able to bring Simon occasionally to small, daytime classes, but once I started working during the day that was no longer possible. The guidelines for including children at night classes were extra hazy. It was sometimes done, but it seemed to be a favor granted on a case-by-case basis. Also, a lot of the night classes seemed too energetic, and occasionally too emotionally dark, to bring a small child. And I didn’t want to intrude too heavily on the adult space of the practice room. For over a year, I produced an all-ages 5Rhythms class called Family Waves in two successive Brooklyn venues. The class was taught by rotating teachers including Jason Goodman, Michelle Lampis, Amber Ryan and Alex de Willermin, who generously volunteered their time. Picture many small children (including mine) running in circles and criss-crossing the room, narrowly missing (or not missing) collisions and occasionally indulging the adults by following the teacher’s directions. The class lasted only an hour, but we ranged through various terrain as the teachers attempted to address both the children and the adults at the same time, so it wouldn’t be either a children’s class the adults were just hanging around for or an adult class the children were permitted to attend. For so many of us, 5Rhythms is what has allowed us to heal from a lifetime of pressure to stop moving. It is a doorway to freedom, a path out of constraint. How powerful, I thought, it would be to never stop moving — to have it from the beginning. To be taught and encouraged from when you are tiny that it is alright to be exactly who you are, that the possibilities for aliveness are beyond our wildest imaginings, that you will experience infinite different emotions and that they are all OK. That you are absolutely the only one who can dance your dance, and, at the same time, that you are in no way separate from the fabric of humanity, but are intricately connected with every other being. I very much wanted to share these teachings with my son, to help him to thrive in our increasingly stressful world. But in reality, my precious child was like a wild animal, running at top speed, totally out of control. I was mired in conflict. Authentic movement seemed essential to my vision as a 5Rhythms parent, but somehow my son had to observe certain boundaries. I struggled to set limits without giving him the message that his way of being was somehow incorrect. Eventually, I had to admit that the format really was not working — at least not for Simon. And I was so stressed with trying to manage the red tape of the class and Simon’s behavior at the same time that it didn’t make sense to continue the project. Fortunately, a short time after the Family Waves class dissolved, a policy was made officially allowing children to attend the Sweat Your Prayers class on Sunday mornings, so I had a new way to hold the door open for Simon. When I contacted Alex de Willermin, one of the Family Waves teachers, to ask her opinion about the best way to expose children to the 5Rhythms, she emphasized that the first point of contact is for parents to dance with their children at home so that their children could “see their parents dancing and feeling much more relaxed, present and connected after they do.” She stressed the importance of using “language to help tap into their curiosity, playfulness, and imagination; as well as clear rules: whether to give permission or set boundaries.” In Alex’s words, “Society could only benefit from children becoming more confident and comfortable in their bodies — with their emotions allowed and their being affirmed.” Notably, Alex is currently teaching Family Waves classes in her hometown, Paris, a re-incarnation of the multi-generational class that we piloted in Brooklyn. Daniela Plattner, a 5Rhythms teacher who herself began practicing around the age of 8, also shared her thoughts on raising kids in the 5Rhythms. “The best way to expose children to 5Rhythms is to bring them to class.” She went on to say, “We need to get 5Rhythms in kid-relevant places.” Daniela, for example, did her first 5Rhythms class at her local skating rink. At a Sweat Your Prayers class taught by Kierra Foster-Ba, I was joined by Simon, our ten-year-old cousin, and my uncle, who were visiting New York for the weekend. On entering, the two children settled into a spot at the edge of the dance floor and played with some action figure toys they had smuggled in. Before long they moved to the middle of the room, still playing with their toys, sticking close to a column. My uncle had entered before us, and seemed right at home, falling into movement right away. I had a delightful dance, myself. At one point, one of my all-time favorite dance partners entered the studio and we jumped right into a high-energy dance of joyful abandon. My cousin watched this unbridled engagement with hesitant interest, but both children continued to play on the floor. I danced near them several times, gently prompting movement, then drifting away again, leaving them to their game. At one point I looked over and both were on their bellies, holding their ankles, laughing and rocking. It wasn’t until the second wave that they started to enter into the dance, themselves. Remarkably, they got up the courage to move just as we entered into Chaos. I cheered them on with my gestures, smiling as they jittered and jumped, getting into the music. This week, Simon turned seven. We had a jam-packed, rollicking party with nearly seventy people in our apartment that included singing, dancing, playing music and rough-housing — a chance to practice a manageable version of Chaos in the face of the growing chaos of the national arena. The day before his birthday, Simon called me back to the room after I put him to bed, crying. “Mommy, I’m sad for you that I’m getting older and I’m not a baby now!” “Oh, no! Simon, I’m a little sad that you are not a baby anymore, but I’m even more happy and proud about the young man you are becoming!” Realizing he is growing up quickly strengthens my resolve to offer Simon all that I can in terms of coping skills as he matures and inherits this crazy world. Simon and I have a ritual for entering a class that started when he was tiny, designed to help him to be aware of sacred space. Our ritual is to stand on the threshold of the studio door, hold hands, take a big breath in, then, as we exhale forcefully, we jump into what we call “The Magic Dance Room.” Today, once across the threshold, we find a spot, tucked into a comfortable corner near a pile of coats, and Simon gets himself settled as I start to move around the room in Flowing. He pretty much burns through all of his snacks during Flowing in the first wave, then gets up in Staccato to join me on the dance floor. He wants me to hold both his hands, and he makes this very clear when I try to release one hand and extend my range of motion. In the elevator, people are generous with their attention, and Simon feels seen and welcomed. The class’s producer, who is set up with a small table filled with postcards announcing upcoming events and a folding chair, kindly welcomes Simon’s hug and kiss with open arms as we prepare to enter the studio. When Simon was tiny, he often wanted to be carried during a class. If he was on the ground, he would wrap his arms around my leg. I found an entirely new and fascinating way of moving, a previously undiscovered aspect of self, even with one leg restricted and grounded, that I would never have otherwise uncovered — the depths we can perhaps only find when faced with limitations. I reflected that although some might see having a child as limiting their experience with his dependence and in providing certain constraints, Simon has given me a door into vaster freedom than I had previously been able to conceive of. Especially in the first two years after his birth, creative work has flowed from me into the world. Since we had just celebrated Simon’s birthday, I relived the memory of giving birth to him. Simon was born at a warm, quiet birthing center without any drugs or medical interventions. I danced Flowing in the intervals between contractions, and worked through each of the rhythms in the process of giving birth, pounding out a staccato rhythm on the side of a large bathtub as I labored, raising massive energy and letting go in Chaos as the baby came to light, blinking my eyes in delighted Lyrical as I looked at him for the first time, and breathing in Stillness as we rested together, absorbed in a whole new reality. In this case, in the Sunday class, I am moving very much in Staccato; and my dance remains attentive to Simon’s needs. He trots out some more fancy footwork as we move around the room, still holding tightly to my hands, and looking at all the dancers around us. As Chaos arises, Simon goes back to his spot in the corner and plays with his Legos. I move around the room, then join with a good friend in Lyrical, letting extensions pull me upward, and following her pendulous spinning. In Stillness, Simon and I both stretch out on the floor and roll slowly, side by side, into the middle of the room. Before long, I sit up, continuing to move near him, but he remains on his back, pushing himself slowly through the room with his bent legs, gazing upward at the dancing adults. Michelle also believes that exposing children to 5Rhythms concepts “gives them more tools for expressing what they need and how they feel. Each rhythm can become a reference point and provide emotional vocabulary.” She goes on to say, “We don’t have a culture that gives us avenues to explore and understand our emotional world. Mostly we aren’t meant to feel ‘too much’ or ‘too big’. The 5Rhythms provide a place to express it all.” She adds, “I hope it will mean that my son and I have a language that will involve all aspects of our experience — our thoughts, our emotions and our bodily sensations.” 5Rhythms has the potential to not only expand our shared language but also, in the process, to expand our very capacity for experience. As the next wave starts, Simon takes another Legos break. Joining me in Staccato, we dance close to where he has his Legos and toys. He lets go of my hands again and gets creative with his feet as we move toward Chaos, letting me loop around him, ranging over several feet. As Chaos deepens, Simon goes back to his spot in the corner again, while I move into an exceptionally creative Chaos with the favorite dance partner who has delighted me by making an appearance. At home, we have always danced. There are often 5Rhythms-inspired experiments, but really it is a blend of yoga, dance and rough-housing that most often takes place in our living room. We also use the vocabulary of 5Rhythms in our discussions. For example, using the language of Flowing to talk about how to move on a crowded sidewalk in our home neighborhood, Fort Greene, Brooklyn. Another example is talking about the energy we need to bring to getting somewhere, Flowing — “taking our time and looking at everything mode,” or Staccato – “efficient mode” — when we need to be about business and timetables. Yet another is in talking about the Chaos of trying something new, and how sometimes people get stuck in ruts and are afraid to experiment. In fact, many of our daily conversations are inflected with the 5Rhythms, which helps us to connect and to communicate in ways that are meaningful. Back to the Sunday class after the 7-year-old birthday party, in Lyrical, Simon points silently to the door, and we both step out of the studio briefly. “The music is too loud. It’s hurting my ears,” he says. “OK, we can stay out here for a little while.” “We can go back in when the song is done,” he says, leading me back into the room as soon as the music shifts. Coming back through the door into the studio, the rhythm of Stillness has already begun to unfold. Simon pours his weight onto my forearm, as he does when we are walking home and he is extremely tired. We are invited to partner in a conscious speaking exercise to answer the question “Why are we here?” and sit on the floor facing each other, in “criss-cross-applesauce” posture. We snuggle with his head on my shoulder and our arms wrapped around each other. After a few moments, I say, “Do you want to talk about why you think we’re here?” Without pausing Simon says, “I think we’re here to learn to be calm. And gentle. And also to be fast. And to notice things,” he says, probably answering in terms of why he thinks we are here in the class, today, not existentially, as I had assumed the teacher meant the question. I kiss his forehead, then take my own turn to speak, saying, “I think we’re here to make others happy and to make ourselves happy.” It seems that his “today” answer and my “existential” answer were pretty similar anyway. We continue to snuggle and to rock back and forth gently. At one point, I gather him into my arms, sideways, like when he was a small baby, and rock him gently. As the final song begins, Simon rests the back of his head on the tops of my feet, leaning backward over my knees, relaxed. I feel a rush of love and gratitude, as we hold hands and gently move each other’s arms, listening to the last song Gabrielle Roth ever recorded. I am grateful for the many moments of glorious connection, when the practice draws back the veil of mundane experience and reminds me of the divine blessing of my sweet little boy, my darling son. We end our adventure with a special lunch and talk about our experiences. I say, “Simon, I am so happy to have had this chance to practice with you. It makes me so happy. I hope that the 5Rhythms will help you build up your happiness skills”. I think, but don’t say, my little one, who is quickly getting big, I hope the practice arms you to deal with a frightening world that I can’t protect you from. I hope your heart will guide you always, and that you will never forget that moving is your birthright—the destiny that gave birth to you, that gave birth to all of us.